29 October 2013, at 12:00a.m. Researchers based at the USDA Agricultural Service (ARS) Plum Island Animal Disease Center have been making progress on the development of vaccines against major livestock diseases such as Foot and Mouth Disease (FMD), Classical Swine Fever), African Swine Fever (ASF) and Vesicular Stomatitis, writes Sandra Avant of the ARS. A deadly animal virus is on the loose, treading through Russia and knocking on the doors of Eastern Europe and Asia. After its introduction into the Republic of Georgia and the Caucasus region in 2007 and spread into Russia, the virus that causes African swine fever (ASF) was spotted for the first time last year in Ukraine, putting European and Asian countries on high alert. 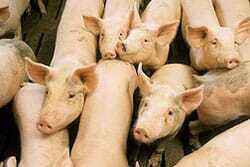 The virus moves quickly, killing 100 per cent of infected pigs within a week in some instances. 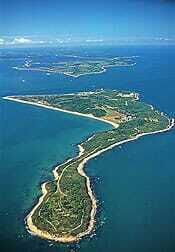 Aerial view of Plum Island, an 840-acre island located 1.5 miles off the northeastern tip of Long Island, New York. The island is home to ARS’s Foreign Animal Disease Research Unit, where ARS scientists collaborate with colleagues from the Department of Homeland Security and USDA’s Animal and Plant Health Inspection Service to protect America’s livestock from foreign animal diseases. 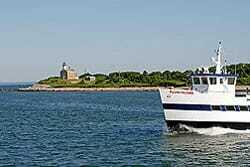 The MS Plum Island makes the crossing between New York’s Orient Point and Plum Island several times a day, carrying passengers and cargo as part of normal Plum Island Animal Disease Center operations. Two other boats – the MS Shahan and JJ Callis – are in the fleet of passenger and cargo marine vessel supporting daily work and operations at the Center. Research associate Paul Lawrence prepares a gel to analyse expression of foot-and-mouth disease virus (FMDV) proteins as part of microbiologist Elizabeth Rieder’s research on novel FMDV vaccines. In efforts to develop an effective vaccine against African swine fever virus (ASFV), graduate student Erin Howey (foreground) performs immunofluorescent screening of porcine tissues for ASFV with veterinary medical officer Jonathan Arzt. Standing between a possible US invasion by foreign animal diseases like ASF is the Plum Island Animal Disease Center, situated off the northeastern tip of Long Island, New York. For almost 60 years, the Center has served as somewhat of a fortress, where a small force of scientists tackles dangerous diseases that threaten the health of livestock and world economies. In 1954, the US Department of Agriculture’s Agricultural Research Service took over Plum Island from the US Army to establish laboratories where scientists could find ways to prevent and control exotic diseases that threaten US livestock production and global food security. The primary objective was to develop methods to detect and prevent foot-and-mouth disease (FMD), an economically devastating disease. FMD was eradicated from the United States in 1929 but today, it is spreading throughout Asia and Africa. Recent outbreaks have occurred in the United Kingdom, Bulgaria, Japan and South Korea. Working with other agencies, scientists in the ARS Foreign Animal Disease Research Unit (FADRU), at Plum Island, also keep diseases like ASF, classical swine fever and vesicular stomatitis at bay. In 1984, a USDA Animal and Plant Health Inspection Service (APHIS) team took over diagnostic work, leaving the basic research to ARS scientists. Another change occurred in 2003, when Plum Island operations were transferred to the US Department of Homeland Security (DHS), which works with USDA in the advanced development of vaccines and diagnostic tests to help control and respond to disease outbreaks. The Plum Island Center provides a safe setting for studying FMD, which affects cloven-hoofed animals like cattle, swine, sheep, goats and deer. The highly contagious disease is rarely fatal in adult animals but it debilitates its victims and can cause large-scale death of young animals. Incursions of FMD cause profound economic consequences through isolation from trade, loss in milk production, severe lameness, and massive depopulations. When the virus has been introduced in FMD-virus-free countries, millions of animals - infected and uninfected - have been euthanised after outbreaks to prevent the virus from spreading. A breakthrough in FMD research came in 2010 when veterinary medical officer, Jonathan Arzt, identified the site where FMD virus initiates infection in cattle. Working with FADRU research leader Luis Rodriguez and microbiologist Juan Pacheco, Dr Arzt found that the virus selectively infects epithelial cells in the back of the cow’s throat. There are seven FMD virus serotypes—O, A, C, Asia-1, SAT-1, SAT-2, and SAT-3. Scientists detected the infection site using serotype O and have since had the same success with serotype A. In other work, scientists have helped build an infrastructure for testing, biosecurity measures, and identification of FMD virus strains in Vietnam and Pakistan. “Our goal is to help them discover how FMD outbreaks are initiated under natural conditions so they can protect their own herds, but it also gives us an advance look at the FMD virus strains that are currently emerging and circulating,” Dr Arzt said. In the last 15 years, FADRU scientists have proven that interferons - proteins made and released by host cells in response to the presence of viruses or other pathogens - protect against FMD. Interferons act as antiviral agents that kill the virus or stop it from multiplying and reproducing. This is potentially a very important tool for controlling FMD outbreaks because FMD spreads very rapidly; by the time animals are vaccinated, the virus may have already spread to other herds. There are three families of interferons; type I (interferon alpha-beta), type II (interferon gamma) and type III (interferon lambda). Retired ARS chemist, Marvin Grubman, demonstrated that type I is very effective in controlling FMD virus infection in swine. Vaccines require seven days to induce protection against FMD, leaving vaccinated animals susceptible to infection during that time. Therefore, scientists are trying to cover that window of susceptibility by combining interferons with vaccines. By combining type I and type II interferons, Dr Grubman produced another patented antiviral vaccine-delivery technology that rapidly blocks FMD virus in pigs. In combination with a vaccine, it provides thorough protection from day 1 until the vaccine immune response kicks in. However, this approach has not been as successful in cattle. De los Santos and FADRU computational biologist, James Zhu, have discovered a solution to the problem of rapid protection of cattle. The Plum Island team was the first to report and identify a type III interferon in cattle. They also demonstrated that type III interferon is effective against FMD virus in cattle as early as 1 day after vaccination. “We first discovered that a member of the type III interferon family could actually inhibit FMDV replication in cell cultures,” Dr de los Santos said. “We then inoculated cattle with a viral vector that delivered bovine type III interferon and challenged with FMD virus 24 hours later. We saw a significant delay in the appearance of clinical signs in animals that received type III interferon as compared to those given type I interferon or no treatment. In other experiments, where cows were naturally exposed to FMD virus, the type III interferon treatment was even more protective,” she added. Scientists also constructed a mutant virus, called 'SAP-mutant', which has a mutation in one of the virus’s proteins, named 'leader'. They used the SAP-mutant to develop an attenuated (weakened) FMD vaccine, which when administered to pigs can protect them against challenge with virulent FMD virus. Working with Dr Zhu and other colleagues, Dr de los Santos used a reverse genetics approach to understand the basis of attenuation of the SAP-mutant. Unlike classical genetics, which seeks to find the genetic basis of a trait or phenotype, reverse genetics attempts to find what trait appears as the result of a particular gene mutation. Microbiologist Teresa de los Santos uses an automatic liquid handling system to prepare multi-well plates to study immune responses of swine to foot-and-mouth disease virus infection using real-time PCR. 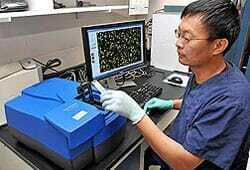 Computational biologist James Zhu scans a microarray containing over 44,000 features of the bovine genome. Differential gene expression is used to understand the response of cattle to foot-and-mouth disease virus infection. Molecular biologist Elizabeth Rieder (background) and research associate Devendra Rai view the effect of mutations on the three-dimensional structure of the FMDV polymerase protein in studies to develop FMD vaccines. In other research, a team led by microbiologist Elizabeth Rieder has designed new technology for producing FMD vaccine without the need of virulent virus. “We cloned the FMD virus genetic material in a plasmid [a small DNA molecule], which allows us to introduce mutations and produce deletions in the virus and understand the functions of particular parts of the virus genome,” Dr Rieder explained. Researchers identified a sequence that, if removed, renders the FMD virus harmless to animals while still leaving it capable of growing in cell culture. Scientists used this technology to produce a new FMD vaccine. This technique is safer than current technology, which uses naturally occurring (wild-type) virus, because the attenuated FMD virus does not cause disease in animals, Dr Rieder said. In addition, the virus used in the vaccine has been labelled with unique markers to differentiate it from wild-type virus found in outbreaks. 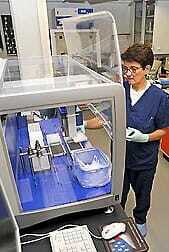 A patent has been filed for the new technology, which is being developed for vaccine production by a private company. Immunologist William Golde and his team were the first to try - in swine - a technology used by physicians to type humans for organ transplants. The team used it in swine and cattle to measure specifically immune responses to FMD vaccines. The technology, called 'major histocompatibility complex (MHC) tetramers', allows scientist to follow immune responses mediated by individual T-cells. MHC is a molecule located on the surface of a cell that mediates interactions of white blood cells with other body cells. Dr Golde’s other work includes testing an automated, needle-free, vaccine-delivery device called 'DermVac', which induces stronger immunity with less FMD vaccine. Animals vaccinated by this method, with just a fraction of the recommended vaccine dose, were protected from disease when infected with FMD at seven or 28 days after vaccination. Although classical swine fever (CSF) has been eradicated in the United States, the contagious, sometimes fatal disease is present in wildlife in Europe, where infected wild boar can transmit it to domestic pigs. “Once the disease is detected, all animals in close proximity of infected pigs must be destroyed, creating a huge economic problem,” says microbiologist, Manuel Borca. “Vaccination is banned in Europe but it would be considered if a marker vaccine is developed.” A marker vaccine allows vaccinated animals to be distinguished from those infected with wild-type virus. Under the leadership of Dr Borca, scientists at Plum Island have been using different strategies to develop virus strains for vaccines that meet these criteria. They identified 10 to 12 different areas of the virus genome that, if mutated, cause the virus to become attenuated. Using this approach, a CSF virus was genetically manipulated not only to attenuate it but also to introduce a genetic marker that can distinguish it from wild-type virus. Dr Borca received a patent for this marker virus, which produces early immunity within the first week of vaccination. Earlier CSF work at Plum Island included the development of a rapid diagnostic test, based on real-time PCR (polymerase chain reaction), which detects the virus in infected animals two to four days before clinical signs appear. In research on immune system response to FMDV infection and vaccination, immunologist William Golde looks at cattle white blood cells to be characterised by fluorescent antibody cell sorting. ARS discoveries are providing vital information to help fight this economically devastating disease, which affects cattle and other cloven-hoofed animals. Veterinary medical officer Jonathan Arzt (left) and microbiologist Luis Rodriguez discuss distribution and characterisation of FMDV-positive cells at the primary site of infection in the bovine nasopharynx, a potential target for more effective FMD vaccines. An outbreak of African swine fever (ASF) in the Republic of Georgia and surrounding countries in 2007 prompted ARS to renew efforts to find ways to prevent or control this serious disease, for which there is no cure or vaccine. Concern over ASF is heightened by its unrelenting spread towards Europe since 2007. Its clinical signs are similar to those of CSF but ASF is more uniformly fatal. Pigs suffer from high fever, haemorrhages, vomiting and loss of appetite. All attempts to produce effective vaccines have been unsuccessful so far because of the complexity and large size of the ASF virus. In earlier years, scientists at Plum Island made significant progress in understanding the role of particular ASF virus genes in causing disease. Dr Borca was part of a team that was able to characterise several genes that are important in virulence. Animals given the attenuated viruses and later challenged with a virulent virus were protected against ASF, he says. After a seven-year lapse in ASF studies due to limited funding, research has been re-initiated by ARS scientists, under Dr Borca’s leadership, using these same techniques. Another livestock invader is vesicular stomatitis virus (VSV), which rarely occurs in the United States but can infect humans and some wildlife species. No effective vaccines are available for the disease, and the virus is transmitted by insects. “Black flies and sand flies are involved, as are the tiny culicoides insects, also called ‘no-see-ems,’” he added. Working with scientists in Mexico, Dr Rodriguez recently traced the origin of a large number of 2008 outbreaks in northern Mexico to southern Mexico. 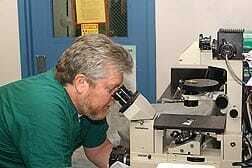 He identified the virus strain and predicted that it might spread to the United States. Indeed, this virus was the cause of outbreaks in New Mexico in 2012. While ARS scientists at Plum Island work with universities, industries, international organisations and governments, their innovative technologies and discoveries are enhanced by APHIS and DHS support. The main goal is to prevent and control foreign animal diseases by developing improved tools for diagnosing diseases and creating safe, faster acting vaccines and biotherapeutics. 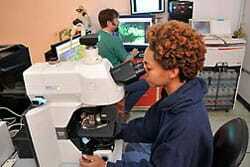 APHIS confirms diagnostic tests and technologies for surveillance, detection and response to disease threats. DHS assists in developing vaccines and other countermeasures required for an effective response to a foreign-animal-disease outbreak on US soil. This diligent teamwork at Plum Island helps protect livestock, humans and food supplies from diseases that put America at risk. Find out more information on the diseases mentioned here by clicking here.